Sure, I get it. You're looking around your house and thinking, hmmm, people are coming over for dinner - how can I make the table look nice? No need to break the budget buying bouquets of flowers, and No, you do not need to go buy all of the recent items from the Target dollar section. Although, I must say it's tempting! 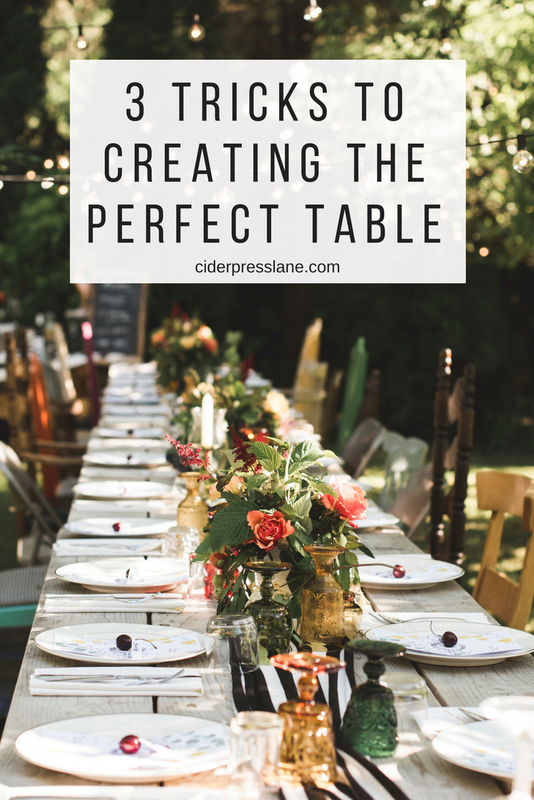 These are my top 3 tricks to creating the perfect table. Find a piece of fabric. This doesn't have to be a table cloth or runner. What about a piece that was left over from a project? Maybe you have a cool set of sheets that you're done with, a blanket scarf, a couple of thin tea towels? Start looking through your drawers and cupboards for an item you can repurpose. Let's give an old project new life! One of my table designs I used a little bit of left over lace...mixed with a little piece of leftover peacock fabric. I didn't even have time to hem them, we just tucked the rough edges under, did a little ironing and called it good. Pull out ALL of your candles, votive holders, tapers and tea lights : plus any small bowls and bottles. Which candle holders will compliment your fabric? They don't have to be the same color, just in the same family. It's okay to mix and match different metals and textures - actually the more the better. The biggest thing you want to keep in mind is that you want to create groupings to fill the space. Each grouping should have an odd number of items with varying heights. We used mismatched jam and baby food jars with a few gold votives that we already had. Add in that extra piece of lace we had from another project and the table is almost ready. Add in a little life. Now comes the greenery. If the flowers aren't blooming and you don't already have some on hand, find some greenery. It's amazing how the random bushes, ivy, ferns and plants in your yard can create just enough life on the table to make it feel complete. use short vases/bottles - you want to be able to see each other across the table! vases aren't required! If you can forage enough moss, ivy, ferns, salal, boxwood and such then weave the greenery down through the candles to create a fresh runner. For another one of my tables I've used cuttings of ivy from our yard + babyfood jar votives + a few fresh lemons tucked in. Fruit counts as a Live Item! Now you're ready - making use of what you have in the most beautiful way possible. It's easy to look in our drawers and cupboards and just see old jars and half used candles - put them all together in a new way and they have new purpose. Your dinners have the same potential to make a difference. Want to know how? Click here to get our Free How to Host a Dinner that Makes a Difference Guide! Cheers to filling your tables friends!